2) Keep evacuation maps, pet carriers & pet supplies readily accessible. If you need to evacuate, you should know exactly where every important item is. If your pets require carriers, keep them in a place that you can access easily. It is also important to keep a pet “go bag” containing food, water, medications, bowls, leashes, treats, and any other supplies that your pet(s) require. It is a good idea to have enough of these necessary items to last about three days just to be safe. 3) Practice your plan. Include your pets in your home evacuation drills. 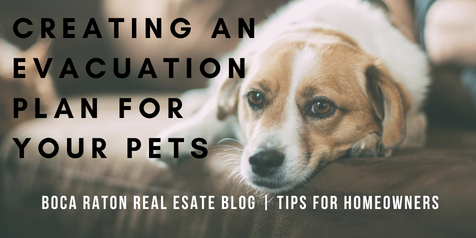 Running through the pet evacuation plan in advance will give you the opportunity to see how they will respond and to make changes to your plan if necessary. Getting your 100-pound dog out of a window may not be as simple as you think! 4) Be prepared in case you get separated from your pets. No matter how much you drill your evacuation plan, it is always possible that a dog or cat will run off while you’re focusing on keeping your family safe. A microchip or a GPS-compatible tag can help you find your pets once it’s safe to return to the area. They say you can never be too prepared, and this is most definitely true when it comes to natural disasters. When you prepare for a disaster and are creating your emergency evacuation plan, remember to prepare to take care of the entire family—including your pets.